Contrarian Alert: Mutual Funds Are Buying This Rally – Should You Sell? Most licensed and bonded professionals are considered authorities in their field. Usually you do as they say. Almost the opposite is true for financial pros, mutual fund managers. It often pays to do the opposite of mutual fund managers. I’m not a craftsman, so if a pipe springs a leak I call a plumber. To get the job done right you call a pro. Unfortunately, the same principle doesn’t always apply to investing. Often the opinions of the investment pros – mutual fund managers – work better as a contrarian indicator than an actual authority. That’s what makes the recent mutual fund manager survey interesting. Each week the National Association of Active Investment Managers (NAAIM) surveys money managers to see how aggressively they are positioned, long or short. The positions can range from leveraged bullish (200% net long) to leveraged bearish (200% net short). The average mutual fund manager is currently 87.5% net long, that means that for every $100 under management, $87.5 are invested in stocks. That’s not an all-time high, but as the middle portion of the chart below shows, fund managers are not often that bullish. The chart plots the S&P 500 (SNP: ^GSPC) against two facets of the NAAIM survey. The vertical red lines highlight the correlation between extreme readings and the S&P 500 (NYSEArca: IVV). Another interesting data point is the ‘last bear standing’ portion of the NAAIM survey. The most bearish manager polled, on average, is leveraged short (negative 110%). The most bearish manager right now is 15% long. Rare as those bullish readings are, they are not as bearish for the S&P 500 (NYSEArca: SPY) as we’d expect from a contrarian sentiment indicator. Some extremes led to corrections (October 2007, April 2010, February 2011), but in other instances (January 2007, September 2009, December 2010, January 2013) stocks just kept on trucking. Although on most occasions eventual corrections erased all or most of the gains accrued since the extremes were registered. Another indicator that provides a sneak peek at what mutual fund managers are thinking are mutual fund cash levels. Just like a fire needs wood to burn, stocks need cash to rally. How much cash is left to drive stock prices up further? 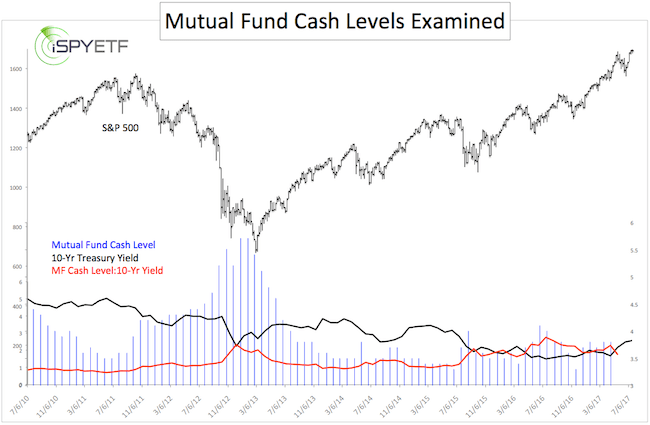 The detailed mutual fund cash level analysis featured here provides interesting inside with a twist. For much of the post-2009 QE bull market mutual fund cash levels have been cited as the reason why stocks can’t move any higher. Rising stocks have silenced this notion. Here is another look at near record fund manager bullishness and what it means today. No doubt there are some brilliant mutual fund managers, but only a few of them consistently beat broad market indexes like the S&P 500. The fund manager profession may consider this an insult, but viewed as a group they are often more valuable as contrarian indicators. Just like a fire needs wood to burn, stocks need available cash to rally. Mutual fund cash levels are one gauge of ‘sideline money’ left to bid up price. Historically, fund managers are close to fully invested near market highs and out of the market near market lows. The chart below illustrates just that. Mutual funds (blue columns) were almost fully invested before the S&P 500 (SNP: ^GSPC) went into meltdown mode and held record cash positions when the S&P 500 (NYSEArca: SPY) took off in 2009. In other words, investors were fully exposed to losses and held much cash at a time when they would have wanted to own stocks. But enough beating up poor fund managers, let”s take a look at current mutual fund cash levels and the implication for stocks going forward. As of June, mutual funds had 3.8% of funds invested in cash. This is somewhat near the all-time low of 3.3% in December 2012. However, considering that the S&P 500 is trading higher than in December 2012 or any time in 2007, the current mutual fund cash level is actually not that alarming. Another fact to consider is interest rates. In 2007 the 10-year Treasury Note yielded up to 5% while the 10-year yield was below 2% for much of 2013 (black line at bottom of chart). In other words, the incentive to hold cash in 2007 was much higher than in 2013. The red line at the bottom of the chart adjusts the mutual fund cash level for interest rates (mutual fund cash level : 10-year yield). Based strictly on a balanced assessment of mutual fund cash levels, managers are not yet uber-bullish. But mutual fund cash levels aren’t the only way to gauge what the pros are doing. A little-known indicator provides a sneak peak at what mutual fund managers are thinking (and doing) and what it means for stocks going forward. 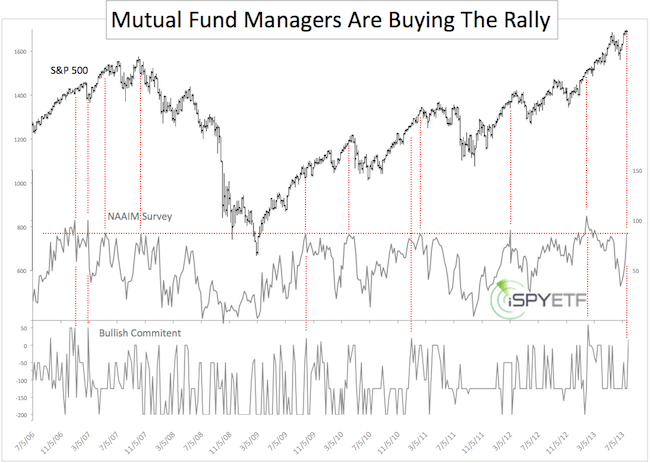 Based on this indicator, fund managers are really buying into this rally. Is this a contrarian alert? The article ‘Contrarian Alert: Mutual Fund Managers Are Buying This Rally – Should You Sell?’ features a detailed analysis of this little-known indicator. Investors Intelligence reports 336 buying climaxes for the week ending July 26. This is the fourth highest reading of the year. While there is a short-term message, the big picture message of recent climaxes looks more important. 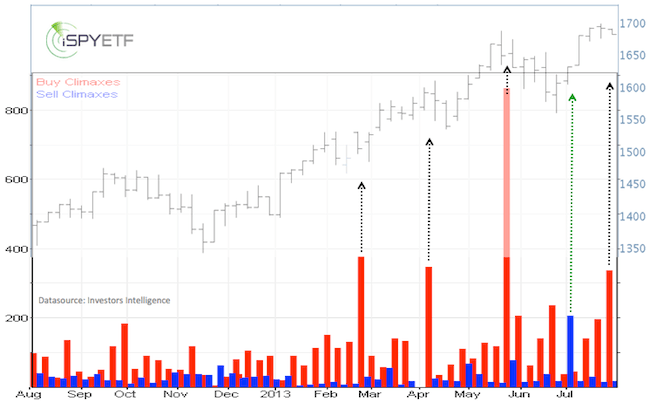 Investors Intelligence (II) reported 336 buying climaxes for last week. Buying climaxes take place when stocks make a 12-month high, but close the week with a loss. They are a sign of distribution and suggest that stocks are moving from strong hands (long-term investors) to weak ones. This sounds bearish, but what does it really mean for stocks? The image below superimposes the S&P 500 on top of II’s buying/selling climax data. Last week’s buying climaxes almost reached levels seen in March and April, which coincided with corrections of 30 – 70 S&P 500 (NYSEArca: SPY) points. None of the recent spikes in buying climaxes caused lasting damage. More reliable than buying climaxes were the spike in selling climaxes reported on July 1. The last week of June saw 206 selling climaxes, the highest reading in at least a year. This was one of the clues that stocks may rally stronger than expected. Viewed as part of the big picture, the cluster of buying climaxes since March 2013 is noteworthy. After all, this QE-bull market is now 52-month old. The average length of a bull market (according to Lowry’s) is 39 months. This may be early telltale signs of a developing market top. The majority of my supply/demand and divergence-monitoring indicators still suggest new highs ahead, but they should be enjoyed with caution. Actual target levels for a possibly significant market high are revealed in the Profit Radar Report. Follow Simon on Twitter @ iSPYETF. How Big is CAT’s Effect on Stocks and Economy? Caterpillar’s (CAT) earnings disappointed, but is this the only reason why CAT has become the number one target of a famed hedge fund short seller? Could this CAT wreak havoc on the ‘dogs of the Dow?’ Here is how CAT affects the Dow Jones. This CAT is bad news for the ‘Dogs of the Dow’ and has become the number one short target of a famed hedge fund investor. Global construction equipment powerhouse Caterpillar (NYSE: CAT) announced thoroughly disappointing second-quarter earnings on Wednesday. Revenue dropped 15.8% to 14.63 billion and earnings slid 43% to $960 million. Perhaps more importantly, earnings and revenue guidance was lowered as well. Caterpillar’s global dealers have been selling some of their inventory, but largely refrain from restocking CAT equipment due to lacking demand. Related Article: Will $100+ Oil Be a Problem For Stocks And The Economy? CAT already implemented factory shutdowns, rolling layoffs, and expense cutting programs and will continue to do so for the remainder of 2013. A company like CAT, that operates in an economically sensitive sector and has tentacles spread out over the entire globe, provides an interesting gauge of the global economy. Here’s a thumbnail sketch of why many are worried about CAT’s message. Many of CAT’s customers are in the construction and mining sector. Take a look at ETFs like the Market Vectors Gold Miners ETF (NYSEArca: GDX) and you know why mining companies aren’t in a position to chauffeur mined metals in the latest model dump truck. Many metals, such as copper, iron or silver, are used in construction or technology. Slowing demand for metals cautions of a slowing economy. Dwindling demand for construction equipment has the same effect. Just last week, famed short-seller Jim Chanos, founder of Kynikos Associates, picked CAT as his top choice to short for a number of reasons, such as deflating Chinese real estate bubble, slowing cycles and some accounting troubles. Apparently there are plenty of reasons to be bearish on CAT, but how does this affect other stocks? CAT accounts for 4.22% of the Dow Jones Industrials Average (DJI: ^DJI) and Dow Diamonds ETF (NYSEArca: DIA) and is the ninth biggest component. 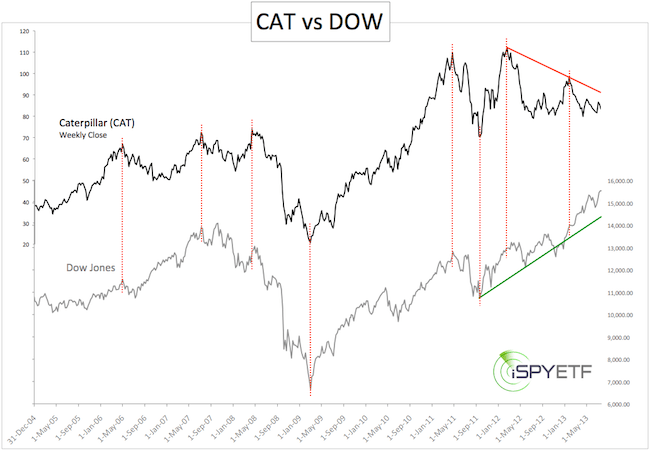 As the chart below shows, there’s quite some directional harmony between CAT and the Dow Jones Industrial Average. In fact, from 2005 – 2011 CAT and the DOW carved out major highs and lows in pretty much the same week every time. This changed in early 2012 when CAT started heading south while the Dow kept climbing higher. and iron prices (related article: Iron Prices And Steel Producers ETF – Another Economic Indicator Sours). What does this mean? There may be a very complicated and intricate explanation for this, but the most likely one is that the economy is weak, but the Fed and other central banks are strong. Oh yes, and stocks might be in trouble … eventually. 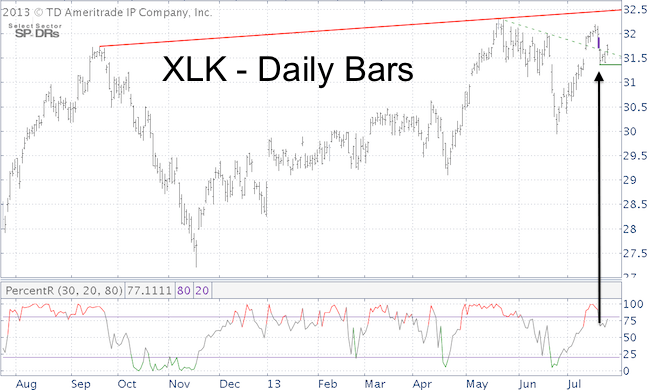 ETF SPY: Will XLK Ride Apple’s Coattail? Apple has broken above resistance courtesy of a post-earnings gap up open. This is a bullish development, but caution is warranted as there’ve been at least 7 dead cat bounces in recent months. Apple accounts for 11.67% of the Nasdaq-100 (Nasdaq: QQQ) and 13.15% of the Technology Select Sector SPDR (NYSEArca: XLK). Although Apple’s effect on the technology sector is not as suffocating as it was at $700 a share, AAPL is still the single biggest component of QQQ and XLK. Interestingly, XLK has thus far been unable to beat its May high, but QQQ did. This lag is not due to Apple, as Apple rallied 11.8% from June 24 – July 17, XLK only 7.51%. The stock market in general is kind of stuck between a rock and a hard place. A correction is due, but any dip is likely to be bought again. This means the up side is limited, but so is the down side. The XLK chart below shows basic support and resistance (solid red and green line). A close below the July 19 low at 31.37 would be a failed percentR low-risk entry, essentially a sell signal. As long as prices stay above 31.37, the open chart gap (purple bar) should be filled. Even a move to the red trend line is possible. This article was written at a time when analysts were ‘bidding’ for the highest Apple price targets. Above 1,000 was pretty much the minimum bet. Apple then dropped from 705 to 385 and has been bouncing aimlessly ever since. 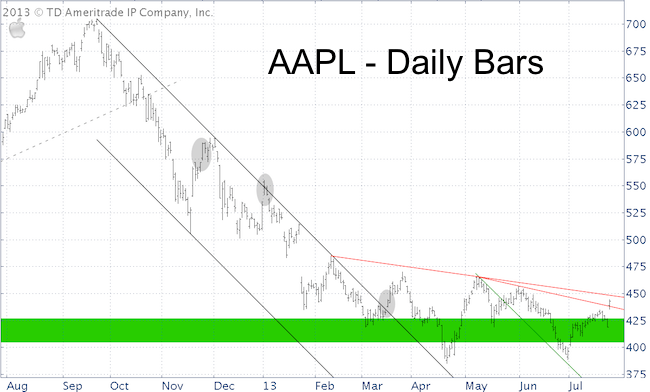 Today AAPL was able to clear short-term resistance at 437. Next trend line resistance is at 448. There have been many false fits and starts for Apple since the April low at 385 and there’s no telling if this bounce will stick. Similar breakaway gaps (gray circles) were retraced shortly thereafter, so it’s prudent to wait for more confirmation. You can follow him on Twitter @ iSPYETF. Gold’s second quarter will enter the history books as one of the biggest declines ever. Until yesterday, gold’s third quarter performance has been boring at best. Monday’s one day pop begs the ‘real rally or bull trap’ question. Gold is special for many reasons. For example, a single ounce of gold can be stretched into a 5-mile long thread or beaten out into a 300-square foot sheet. Gold is also non-toxic. In fact, you may find gold metal flakes in exotic foods or unusual Swiss liquor. I still have an old bottle of GoldSchlager schnapps in my bar. This strong gold flake liquor may help drown the pain of this year’s gold performance, but other than that investors don’t care much about gold’s taste or pliability. Investors buy gold as protection. What kind of protection? That’s a fair question. I guess unless you were looking to buy protection against making money, gold has been little more than an expensive placebo (ask John Paulson). When central banks around the world started to quantitatively ease economies out of the ‘Great Recession,’ gold was considered an inflation hedge. Quantitative easing (or QE) continues, but gold is trading 30% below its 2011 high. This line of fundamental reasoning doesn’t make sense, but many investors still base their gold buying/selling decisions on a similar rationale. Yesterday gold saw the biggest one-day spike of the year. Why? Perhaps you can make sense of this, I can’t. Nutshell explanation: More easy money will mean higher gold prices. If plenty of easy money over the last two years coincided with the steepest gold decline in decades, why would it propel prices higher now? To answer the question that really counts – has gold bottomed? – I rely on technical analysis. Technical analysis is not always correct (nothing ever is), but it got us out of gold when it traded around 1,800 and to this day I receive thank you e-mails from subscribers. 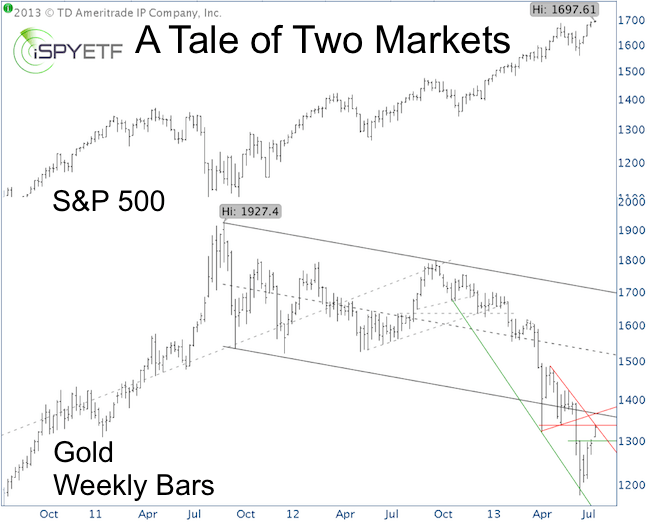 The S&P 500 and gold have been moving in the opposite direction since late 2011. The basic technical picture for gold. The June low occurred against green trend line support. Monday’s bounce hoisted prices above resistance at 1,300. Gold is bouncing against next resistance around 1,335. After gold’s second quarter meltdown prices had to bounce. Until yesterday, it lacked the escape velocity needed to break above resistance (at 1,300), and still another move above 1,335 is needed to unlock higher price targets. Since there was no bullish RSI divergence at the June low (not shown on chart), I’ve been hesitant to embrace this rally. In fact, I would prefer a new low. But the market cares little about what I like. So, as per the July 10 Profit Radar Report, I recommended to take partial long positions in the SPDR Gold Shares (NYSEArca: GLD), or iShares Gold Trust (NYSEArca: IAU), and iShares Silver Trust (NYSEArca: SLV). Thus far the positions have done well and we’ve locked in some profits already and increased our stop-loss to guarantee a winning trade. Gold (and silver) will have to move higher to validate employing more capital on the long side. Myth or fact? Because of its use in many industry sectors, copper is a reliable indicator for the global economy and the stock market. The rationale makes sense, that’s why copper is said to have a Ph.D. in economics, but two charts oust copper as a quack. Copper is said to be the only asset class to have a Ph.D. in economics because of its alleged ability to predict turning points in the global economy and stock market. Here’s a quick sneak peek sound bite of what you’re about to read: If Dr. Copper was a surgeon; you wouldn’t want him to operate on you. Copper is used in most economic sectors: Construction, power generation, power transmission, electronic products, industrial machinery, cars, etc. The average car contains almost 1 mile or 75 pounds of copper. Additionally, copper is an excellent alloy and has become invaluable when combined with zinc to form brass and with tin to form bronze or nickel. Copper is everywhere, that’s why demand for copper is often considered a leading economic indicator. The rationale makes sense, but is it true? We will let the facts determine how reliable an indicator copper really is. The charts below plot copper prices against the S&P 500 over the long-term and short-term. 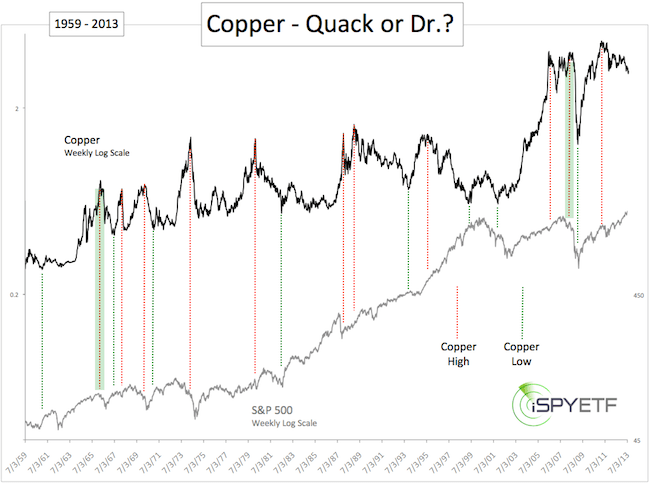 The first chart goes back as far as 1959 and shows copper and the S&P 500 on a log scale. The dotted red lines mark copper highs, the dotted green lines copper lows. Shaded green bars highlight correct signals where falling copper prices predicted trouble for stocks. It is somewhat difficult to correctly portray 54 years of stock market history on a few square inches, but it’s safe to say that copper, as an indicator, missed the mark more often than a Ph.D. should. 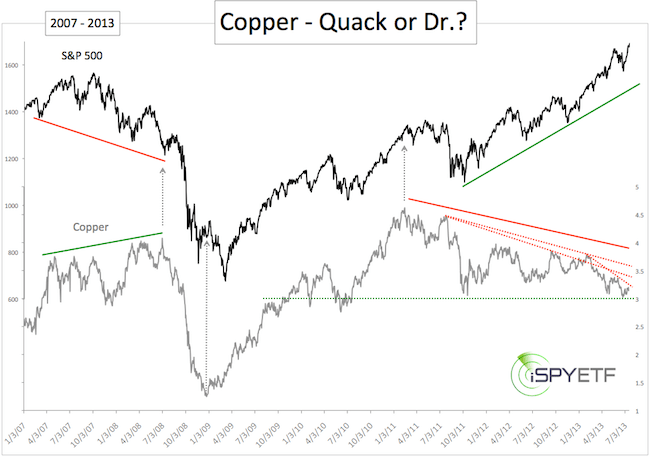 The second chart shows the correlation between copper and the S&P 500 from 2007 until now. The July 2008 copper high came too late to warn of the immediate post-2007 deterioration, but it was just in time to ring the alarm bells before the autumn 2008 meltdown. The December 2008 copper low was a bit too early for the March 2009 stock market low, but correctly suggested higher prices until February 2011. Copper kept up a decent correlation until early 2012, but has been leading investors in the wrong direction ever since. 1) As precursor for the stock market. 2) As precursor for the global economy. By en large copper has failed as a leading stock market indicator (especially since 2012), but one can argue that the global economy has been deteriorating just as copper’s post 2011 decline suggested. If it wasn’t for central banks’ coordinated inflation efforts, copper may have been right on both accounts. Perhaps copper should be compared to ‘peers’ with an actual Ph.D. in economics – economists. Economists are generally bullish around major highs and bearish around major lows. Based on this benchmark, copper may well deserve its Ph.D. Right now copper is sandwiched between strong support around 3 and resistance at 3.2 – 3.3. Marginally higher prices seem likely. If resistance can be overcome copper may rally further. However, a drop below 3 should unleash much more selling pressure. All three copper ETPs are thinly traded, but JJC has thus far gained the most traction.